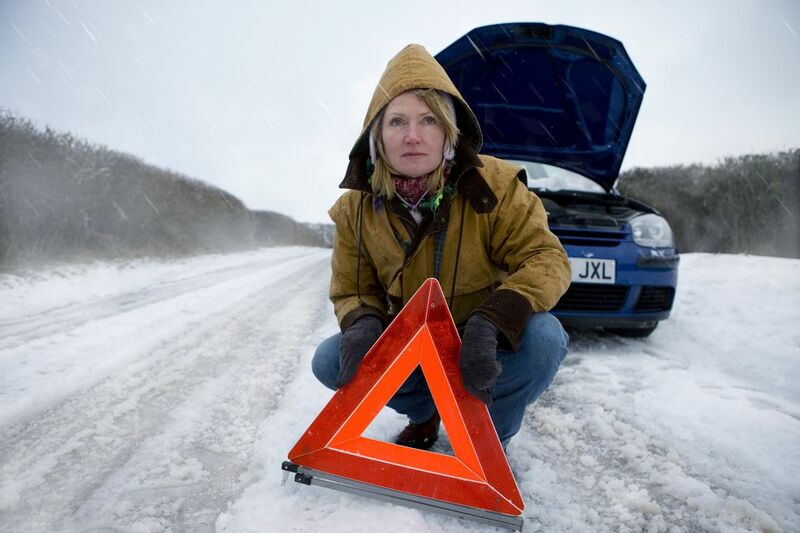 No one plans to have a roadside emergency, but it is nice to be prepared if one occurs. If you do break down, you will be ready to handle the problem and get help. Maps or GPS. You will need these to avoid getting lost and to explain where your vehicle is parked. Money or Credit Card. Don't get caught short in an emergency. Bring cash or a credit card so that you can pay for roadside assistance. Spare Tire. Before every road trip, check your spare tire to make sure it is properly inflated. Some cars do not come with spare tires. If your car is one of them, know what to do if your tire goes flat. Jack. Your spare tire is useless if you can't mount it onto your car. Check your jack when you check your tire. Lubricate it if necessary. Tire Iron. Be sure its packed in your trunk before you leave home. Emergency Reflector Triangle. These are required in Europe a good to have on any continent. Place the reflector several feet behind your vehicle to give other drivers a chance to see you. Fire Extinguisher. Keep it in an easily accessible spot. Tools. Carrying a small toolbox, containing items like screwdrivers, duct tape, Allen wrenches and a hammer will help you repair not only your car but other vacation-related items. Tire Gauge. This helps you measure the amount of air in your tires so that you do not over-inflate them. Keep it in your glove compartment. Water. Bottled water is a must-have emergency supply. Bring enough to get everyone in the family through a 24-hour period, plus extra for your radiator. Cell Phone and Charger. While you can survive on the road without a cell phone, having a phone can speed up the emergency assistance process. A charger will ensure that your cell phone always has power. Spare Headlight Bulbs. These are also required in some European countries. If you are planning to drive a long distance at night, it's a good idea to bring spare bulbs with you. Emergency Contact List. Having a cell phone is useless if you don't know whom to call. First Aid Kit. You can purchase a prepackaged kit or create one from supplies you have at home. Food. Bring along nonperishable items such as beef jerky and granola bars. If you are traveling a long distance in a remote area, also bring canned food and a hand-cranked can opener. Don't forget utensils. Pet Food. If Fido is along for the ride, make sure you have food and water for your beloved friend. Batteries. Pack spare batteries for your flashlight and any other electronic items you have. Jumper Cables. Use these to jump start your car or to help someone else. Car Repair Guide. If you no longer have your car's original manual, purchase a repair guide for your car. Haynes and Chilton are the most popular repair guide publishers in the US. Matches. Use these to light your candle or start a signal fire in a properly cleared area. Candle. A candle in a glass jar can help you see in the dark and can also keep the interior of your vehicle warm in cold weather. Don't light it while you are driving. Comfortable Walking Shoes. If you have to leave your vehicle, it is better to do so in shoes that can take some punishment. Gloves. To protect your hands in cold weather or when making repairs, pack a pair of gloves. Camera. Tuck a disposable camera into your glove compartment. If you have an accident, photograph both vehicles and the surrounding scene before anything is moved. Pen and Paper. If you need to leave a note on your windshield or give information to someone, you will be glad you brought a pen and paper along. Oil. Bring a quart of motor oil in case you need to top up. Be sure you bring the same kind and weight of oil that is currently in your vehicle. Gas Can. If you run out of gas, you will need to bring gasoline to your car in a container. Be sure the gas can is clean and empty. Rags or Paper Towels. After you finish checking or repairing your car, you can use clean rags or paper towels to clean your hands. Funnel. Having a funnel makes it easier to top up your vehicle's fluid levels. Bring a plastic bag to hold the funnel after use. Flashlight. Flashlights are handy for night repairs. They can also be used to signal for help. Mirror. You can use a mirror to signal for help and to see around difficult corners inside your engine. Book. While you're waiting for a tow truck, it is nice to have something to do. Chains or Snow Tires. If you regularly drive in winter weather, put snow tires on your car or carry tire chains. Be sure you know how to put the chains on your vehicle. Windshield Washer Fluid (Deicing). In bad weather, you will use a lot of windshield washer fluid. Carry extra in case you run out. Ice Scrapers. Keep one in your car and one in your luggage. You won't be able to scrape ice off your car if your ice scraper is frozen inside it. Weatherproof Outerwear. Bring a warm jacket, hat and gloves. Yes, they are bulky, but they can save your life. Blankets. Pack a couple of warm blankets in case you break down in freezing weather. Traction Mats, Sand or Cat Litter. If you get stuck in snow or ice, traction mats, sand or cat litter can improve the car's traction and help you drive forward. Shovel. Use this to dig out your car.